Compared with other African countries, Mauritania is small in population (4.6 million). But such a population in combination with the popularity of mobile communication stimulates large flows of voice traffic. Moreover, the country has a high average rate of about 18 cents. If you accommodate voice termination gateways in Mauritania, you can make a profit of $700 and higher from each channel. The telecommunications sector of Mauritania remains underdeveloped due to low economic growth and a lack of foreign investment. But this played into the terminator's hands. Due to poor fixed-line infrastructure, most voice services are provided via mobile networks. Cellular penetration has reached 113% there (over 5 million users). The leader of the mobile market in Mauritania is Mauritel, the second place is occupied by Chinguitel. Mattel is the smallest operator. The GSM operators’ coverage spans most areas, but the subscribers face the problem of a bad signal from time to time. The Mauritanian regulator repeatedly fined the mobile service providers for the low quality of service. Therefore, it is important to choose the right city or village for VoIP equipment accommodation, where the signal would be good. SIM cards in Mauritania cost about $1.5 each. Starting from 2016, the prepaid subscriber numbers are subject to mandatory registration upon activation. In 2017, all 3 mobile operators were fined because they did not register the SIM cards they sold. Therefore, you may be asked to present your ID documents when buying the cards. We recommend buying the SIM-cards for gsm gateway for voip from dealers who sell the numbers for terminators. They can be found in dedicated online forums. 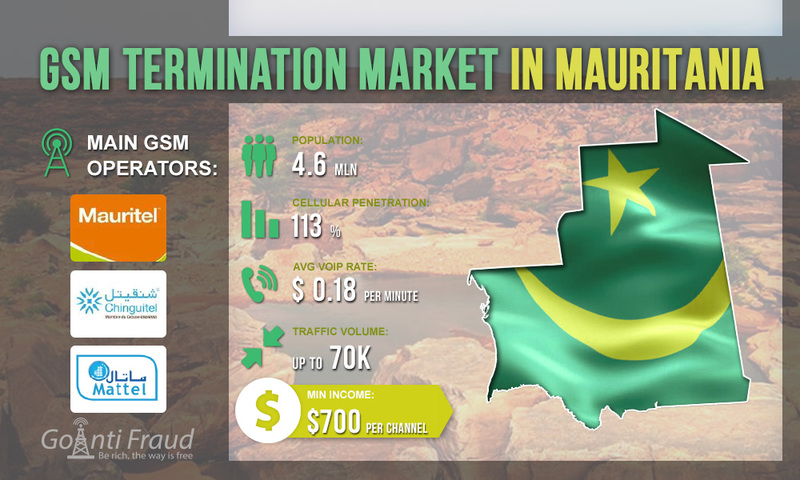 A minute of call costs about $0.2 in Mauritania, which is expensive for termination. But if you take advantage of special offers, the conditions become more beneficial - a minute of a call can then cost about $0.02. Thus, the earnings on the termination will range from $700 from each port of the gateway.